Freshman Ty Amonte’s goal at 1:55 of the second overtime gave BU a hard-fought double-overtime win over Harvard, giving the Terriers their sixth straight win and seventh in eight games. With the victory BU will skate in the tournament championship game for the 53rd time in the 66 years of the tournament and will be seeking its 31st title. The Terriers last won the Beanpot in 2015 with a similar script in the opening game as another second-generation Terrier, Danny O’Regan potted the winner against Harvard in double overtime. BU’s opponent next Monday will be Northeastern, who blanked BC, 3-0. 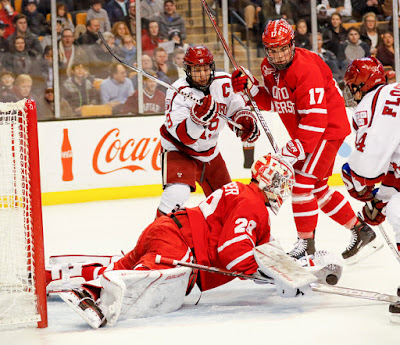 BU also received strong performances from goalie Jake Oettinger and captain Brandon Hickey. Oettinger stopped 47 Crimson shots including 19 in the middle stanza, which Harvard thoroughly dominated. Hickey’s contributions included a goal, an assist and rescuing a puck early in the game that had hit the post and trickled behind Oettinger before it crossed the goal line. BU held a 13-12 shot advantage in a fairly even period. The Terriers got on the board first with a power play goal. Hickey’s shot from the top of the left circle glanced off Drew Melanson and Logan Cockerill, closing in from the right side, banged home the loose puck. The Crimson controlled the majority of the draws and dominated territorially through the second period. Strong saves by Oettinger kept the score 1-0 until late in the period when Melanson was stripped in the BU end and Ryan Donato fed Ty Pelton-Byce in the slot for a one-timer that found the net high to Oettinger’s glove side. BU mustered only four shots on Harvard’s Merrick Madsen in the period—with two on a power play. The Terriers flipped the script in the third period outshooting Harvard 11-6 and regaining the lead just 32 seconds in. Jordan Greenway used his strength to carry the puck into the Crimson zone and held up before sliding the puck to Hickey. The Terrier captain skated to the high slot and backhanded a shot that Madsen kicked out, but Hickey followed up and backhanded the rebound into the net for a 2-1 lead. Harvard didn’t take long to respond, converting on a a 3-on-2 rush. Oettinger saved Nathan Krusko’s initial shot but the puck popped into the air and a hard-charging Jack Badini batted it home to knot the score at two apiece. For the rest of the period and throughout the first 20-minute overtime period, the two goalies put on a show, denying multiple chances for a game-winner. Just shy of two minutes into the second overtime, Amonte corralled a loose puck near the Harvard blueline, circled in the neutral zone and charged down the right and drilled a shot from the edge of the right circle past Madsen’s glove. It was the only shot of the period and the only one BU would need. Amonte’s father, BU and NHL star Tony Amonte, was MVP of the 1991 Beanpot, recording a hat trick in a 5:24 span of the second period of an 8-4 win against BC. Ty's game-winner--his second of the season--was #3 on ESPN's Top Ten Monday Night. Madsen's save on a Dante Fabbro blast also made the Top Ten. Hickey, who scored for the third game in a row, had picked up his 50th career point on Cockerill’s first-period goal. Cockerill's goal marked the sixth consecutive game in which BU has scored on the power play; however the Terriers’ streak of consecutive periods with at least one goal scored ended at 14 when BU failed to score in the second. For Greenway and Donato, who each had an assist, it was the last college hockey game for a while as they head to PyeongChang, S. Korea, to play for the U.S. Olympic Team. ► Bobo Carpenter and Greenway are among 16 semifinalists for the Walter Brown Award presented by the Gridiron Club of Greater Boston to the best American-born player in New England. Terriers also play Harvard in the opening round of the Women’s Beanpot, set for BC’s Conte Forum tonight. BU, which defeated the Crimson in November, 4-3, is looking for its first Beanpot title as a varsity program. BU had won once as a club program.